I don't remember where i got this release, but it is an odd little thing. 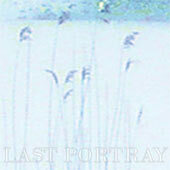 Last Portray are apparently a Swedish shoegaze act, whose only web presence is a MySpace page they abandoned in 2010. This is their sole release, a 3" CD on a label from Peru, and i got a download of it from ... somewhere. I forget. But it's three really cool songs, and so i tried to order it from the label in Peru. I sent them some money via PayPal, but it has never arrived. It was cheap though -- so cheap that i doubted it was enough money for it ship from Peru to Atlanta. And, indeed, i got what i paid for. Caveat emptor and all that. Given that this music is practically impossible to find, why talk about it here? Well, to be honest, there is really something going on. These three songs are wall of noisy shoegaze, just a hard drone built out of layers of distorted guitar, muffled voice, and silly keyboard riffs. The songs hold up to repeated listens, which makes me wonder what happened to this band? Why did they disappear? Did the membesr move on to other things, or is Last Portray still hammering out tunes in some bunker in Sweden? I might never know, but in the meantime, there are three cool shoegaze tunes to enjoy. The first one here is called On The Brink Gazing In and consists of flat drums (which i think is a drum machine, although all details are a little vague), fuzzed guitars, and a keyboard that picks a simple melody. Eventually, as the guitar ramps up, a voice comes in, half heard under the drone. What makes this song is the insistent beat, one of those simple tappings that drives the drone along and just makes me bounce as i listen. The song gets more distorted as it goes, the guitars going crazy, the voice overdriven and whining, the hi-hat tapping away... Great stuff. The middle tune is called Shoegazing Sweethearts, which is such a great title i am surprised that Ride or The Boo Radleys never used it. It starts with the grinding guitar, a similar keyboard riff, and the voice still echoed. However, on this song we are clearly listening to a drum machine, which plods along with a mechanical rhythm. This song is actually clearer than the previous tune, and it reminds me a little of one of those shoegaze bands that used to be on Darla compilations in the late 1990s -- Flowchart, Technicolor, that sort of thing. Also, i can tell that English is not the vocalist's first language in the way that he sings "sweet harr TTTTs". That is probably not really a proper phonetic spelling, but the point is that he just says it odd. Swedishly, i suppose. Anyway, the guitars grind along, he sings Swedishly, the drum machine taps, and keyboards burble happily. The keys are chaotic here, several layers playing against each other. Again, this is a nice fun song. And then we wrap things up with Falling Leaves, which is where it all comes together. The chirpy little keyboard, the echoed voice (here with a female singing a duet with the male lead singer), the overly fuzzy guitars, and the insistent drum beat all blend organically. The elements all complement each other, while on the first song the keyboards seemed to compete with the voice, and on the second the keys competed with the guitar. Here, the blur of sound is balanced. The song also reminds me of very early Isobella. Sure, the female and male voices contribute to that, but there is a sort of naiveté here, the kids (?) just pounding away at their instruments with no care for anything. This song captures a sense of making noise for the sheer unrestrained fun of it. Plus, at 4:48, it is the longest tune here. So, there are three songs from Last Portray that exist, and the third one on their one release is the best. So i guess they went out at the top of their game. Good for them. I will still wonder what happened to them. If you are a fan of shoegaze, keep an eye out for this odd little release.